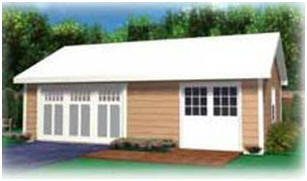 This attractive, gable roof workshop or studio has double hinged doors and an 8' wide overhead garage door on the front. That makes it perfect for moving materials in and big projects out. It's also a makes a great combination garage and shop for small vehicles. Plans available here let you build your workshop in any of four different sizes: 16'x24', 16'x30', 20'x20' and 20'x24'. The two workshops with 20' depths will fit full size cars, SUVs, tractors and small trucks. You'll receive a forty page plan set for each of the four different sized workshops. The blueprints include 1/4" scale and larger plans, exterior elevations, and construction details, electrical layout, foundation and slab drawings, roof rafter cutting patterns, wall framing diagrams and a material list. Plans are $29.00 and are delivered instantly by a link to an easy-to-use web page with this plan set and a variety of other garage, barn, shed and workshop designs. In all, you'll be able to choose from more than one hundred different building designs, layouts and sizes. You'll also be able to download any and all of the plans and print as many copies of each as you'd like. This plan set comes with a complete money-back guarantee. Your plans come with a complete money-back guarantee. Order them and review them for up to sixty days. Print them and show them to your builder, your neighbors or your building department. If they don't meet your needs, for any reason, just ask and you'll get a complete, prompt refund. We are proud of our plans, of our guarantee and that we've been a PayPal Security Verified Merchant, continuously, since June, 2000.